Within the United States there are a variety of livestock marketing options available for cow-calf and feedlot producers. The most popular forms are via sale barns (sale yards), video auctions, or direct (National Cattlemen’s Beef Association, 2018). The United States cattle industry is currently in a growth phase, with the total cattle herd at 94.4 million head. The industry has had four consecutive years of expansion and has now reached its largest since 2009 (United States Department of Agriculture, 2018), with the U.S. supplying approximately 9.4% of the world’s total cattle supply (Meat and Livestock Australia, 2017). The growth is primarily due to expansion in the beef cow herd, with the average cow herd size now 40 head (United States Department of Agriculture, 2018). Currently, there are a total of 913,000 cow/calf producers situated throughout the U.S. (National Cattlemen’s Beef Association, 2017). A large proportion of livestock in the U.S. are sold straight from cow-calf operations to a feedlot or packers (National Cattlemen’s Beef Association, 2018). The majority are being sold to feedlots, as 90% of all cattle are finished within a feed yard (Australian Competition & Consumer Commission, 2017). Despite the increase in farm-feedlot direct sales, sale barns still have a significant place because of the large number of small scale producers. Sale barns inject $US76.4 billion from cattle sales into the US economy, with approximately 40% of sales in Nebraska, Texas, South Dakota, Kansas and Oklahoma (Census of Agriculture, 2012). However, industry trends show that sale barns are becoming less popular with the introduction of technologies such as video, direct and online sales, and more sophisticated data management tools via computer and mobile apps. Eventually, smaller sale barns will shut their doors, although the larger, more modern sale barns will incorporate these technologies which will allow them to stay competitive within the industry through accessing a larger target audience (National Cattlemen’s Beef Association, 2018). Sale barns provide a facility for small producers to sell little lots, allowing buyers to combine the lots into larger runs. Whereas, the larger producers have a strategic plan for the sale of their cattle, via direct marketing, the smaller producers are not as likely to use these strategies. The majority of cattle sold through sale barns are re-stocker heifer and steers that are raised on pasture as feedlot replacements and a significant number of cull beef or dairy cows that are no longer needed for breeding or milk production (United States Department of Agriculture, 2016). Figure 1 below indicates that within the U.S. the number of cattle handled by sale barns declined by 4 million head between 2006 and 2016. 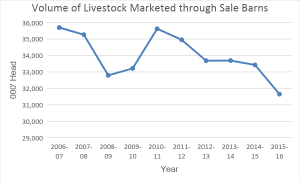 Figure 1: Volume of Livestock Marketed through Sale Barns (United States Department of Agriculture, 2016). The major difference between U.S. sale barns and Australian saleyards is sale barns in the U.S. are responsible for the entire sale process from receivals, sale and delivery. Therefore, producers deliver their cattle and the sale barn employees are responsible for drafting into sale lots, auctioning, delivering and the transactions (B. Cox, personal communication, 2018). This is not the process in Australia as cattle are booked through a stock and station agent; who is responsible for drafting, penning and auctioning each lot. Sale barns in the U.S. utilise a ring selling design. This allows for weighing before being sold, with cattle sold by price per pound (United States Department of Agriculture, 2016). In Australia, most layouts are pen selling, which has less impact on animal welfare, as the buyers move instead of the cattle, and sold by price per kilogram. The U.S. only charge 2.75% to 3.00% commission base for cattle sales (B. Cox, personal communication, 2018), due to lower wages. This rate is much less than the average 4% charged in Australia (Elders, 2018). There are many providers of a video auction service available for producers to sell their cattle. Superior is currently the largest live video livestock auctioneer in the United States (Superior Livestock Auctions, 2018). With only 380 livestock assessors nationwide, this allows Superior to have consistency in the accurate assessment of the weight, breed, diet, history and any issues of the cattle for a detailed description on the webpage (Superior Livestock Auctions, 2018). Unlike conventional livestock marketing methods, with video auctions buyers can visually assess and select lots individually, with access to current Expected Progeny Differences (EPDs). In addition to the information provided with video auctions, it is a more convenient option for producers, whilst minimising the risk of disease, stress and injury as a result of transport, yarding and drafting. Video auctions are conducted fortnightly via Superior Livestock Video Auctions, with strong cattle numbers, the 2018 February average was 21,465 head (United States Department of Agriculture, 2018). This compares to the Australian video market of AuctionsPlus which averaged 9,614 in February 2018, although it is also very popular for ram and bull sales (AuctionsPlus, 2018). Direct sales between cow-calf producers and feedlots, and feedlots to packers is a popular and expanding form of sales method within the U.S. The system can be separated into four direct methods; forward contracts, marketing agreements (formula), negotiation and cash or spot. Marketing agreements are an arrangement from one step of the supply chain to the next to gain a higher return for all parties involved, whilst supplying a consistent, high quality product to the consumer (Future Beef, n.d.). This method establishes an ongoing relationship for trading multiple lots of cattle, with the price determined by a grid formula mechanism for fed cattle, allowing for premiums and discounts (United States Department of Agriculture, 2016). This is advantageous for producers as it follows broader supply and demand trends and is less influenced by individual slaughter plants (Herrington & Tonsor, 2012). This method achieves consistency in the product as they have proven sales and purchase history. Forward contracts are a popular form of direct sales as the price is locked in if the order is fulfilled. This includes selling calves each year to the same feedlot, who sell to the same packer. It may not always be formal agreement. There may be several disadvantages to this method, including, livestock being locked in for a specific date creates stress, and some should be sent earlier or later to meet the weight restriction; or due to market fluctuations another buyer may offer a higher price at the time the contract has to be fulfilled. Larger feedlots and packers within the U.S. prefer to obtain cattle direct, with most feedlots buying about 70% of feeder cattle direct from cow-calf operations and increase to full capacity with sales barn cattle. This is well demonstrated by the Peeler Family Feedlot in Floresville, Texas, who prefer feeder cattle bought directly from the farm via paddock sales, to allow them to establish an ongoing relationship with the producer, whilst also decreasing risk of stress and sickness (J. Peeler, personal communication, 2018). 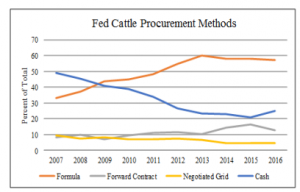 There was an increase in the direct sales methods of grid formula pricing by 25% and forward contracting by 4% since 2007 for fed cattle; a result of a decline in negotiation pricing, as seen below in figure 2 (United States Department of Agriculture, 2016). Figure 2: Fed Cattle Procurement Methods (United States Department of Agriculture, 2016). Sale barns are recognised as the traditional form of selling livestock and perceived as a convenient option for producers. They can be extremely advantageous for producers to gain a high profit, through widespread competition and accessibility to market. There is a large variety of stocking types in varied lot sizes, and payment is guaranteed by the sale barns (Future Beef, n.d.). Without sale barns it would be extremely hard to sell cull stock and smaller lots of cattle, as all other methods require larger lots of cattle. Thus, sale barns allow buyers to group together lines of cattle to fill a load. Larger producers may also use the sale barns for their bull sales. Livestock auction markets are important for the vitality of rural communities. They provide approximately $1 million in total value-added dollars to its local community annually. The facilities provide on average 30 jobs, generate $600,000 in wage income into the community and support local businesses (Livestock Marketing Association, 2017). Without sale barns, small producers also need to travel further which will decrease their profit margin. Without sale barns the true price of cattle is not justified, as direct sales rely on sale barns competition as a starting point to determine their pricing grid. With the proof the fed cattle purchased via competitive sale barn auctions declining in recent years to only 25% in 2016, a small proportion of cattle traded on a cash basis determines the price for millions of head of fed cattle. The thinning of the competition market may cause prices to become more volatile and increase susceptibility to manipulation, making the average more sensitive to the price of each individual transaction. This leads to producer’s loss of confidence that the reported cash market prices are representative of the cattle market (United States Department of Agriculture, 2016). Therefore, the result is processors and feedlots need to be transparent about their pricing grids. There are also many negatives associated with sale barn auctions. Stress and animal health is a major challenge for sale barns, particularly due to co-mingling and high stocking density. Mixing stress and exposure to pathogens can have significant implications for cattle health and performance in feedlots, particularly if disease or vaccination status is unknown (Cernicchiaro, et al, 2012). Subsequently animal performance and meat quality can be reduced by transport and handling, resulting in a reduction in body weight, feed consumption and impairment of the immune system (Cernicchiaro, et al, 2012). The ring selling design in the U.S. creates more movement of livestock, which has the potential to increase bruising and lower carcase quality. There is also no carcase feedback for producers and no negotiation between buyers and vendors (Future Beef, n.d.). Producers in the U.S. and Australia need feedback to make informed decisions about the direction of their business, particularly if livestock are sold through a sale barn to a slaughter plant. Cattle producers use the feedback to assess how they can maximise profit through selection of cattle for desirable traits to receive premiums. Sale barns within the U.S. are faced with many challenges into the future, as video auctions and direct sales become popular options. To stay competitive, they need to implement technologies such as videoing their sales to allow online sales, which will generate more competition through broadening the buyer range. There has been a shift towards direct sales within the supply chain, sold via the grid formula pricing method. This option provides stability for producers and maximises animal welfare. Sale barns are required to keep prices accurate, through competition between buyers, creating more transparency in prices and grids. With innovation and technological advancements, there are opportunities for sale barns in the U.S. and Australia to increase efficiency, via selling more cattle in a shorter amount of time. Overall, sale barns need to offer value-adding services and adopt industry-driven initiatives designed to preserve the quality and safety of the final consumable product. Ben Cox. (2018). Personal communication. Long term manager of the San Angelo Sale Barn. Jason Peeler. (2017). Personal communication. Owner/operator of Peeler Family Feedlot. National Cattlemen’s Beef Association. (2018). Personal Communication. Temple Grandin. (2018). Personal communication. Livestock consultant on animal behaviour.